To that I would like to reply a resounding BULLSH*T! Here’s the scenario: you get to the week before your period and you turn into a bloated, murderous-swinging-to-weepy, unable to connect to your breath support, singer who feels like she’s trying to drive a mac truck rather than a ferrari. Oh, and let’s not forget the killer cramps when you finally get your period. Sound familiar? Good. Well, not good, but let’s unpack three things you can do to lessen all that yuck. Because it doesn’t have to be ‘just how it is.’ And, if the only solution you’ve been offered by your OB/GYN is to take the pill, you definitely need to read this. Those PMS changes are driven by hormone swings. Ideally our estrogen and progesterone are in a happy, balanced relationship and vary a bit as we get close to our period. But, for many of us, we are stuck in an estrogen dominant state: we eat meat, use products that have estrogen mimicking ingredients (called xenoestrogens) like parabens, and drink alcohol. We need progesterone to keep that estrogen in check, but if we’re consuming all those things, estrogen takes over and progesterone can’t keep up. Then we’re bloated, moody, struggle to lose the muffin top, get migraines, and have abnormal paps. We also need to talk a bit about insulin (blood sugar) which is like the gatekeeper for other hormones. When it’s high, it contributes to estrogen dominance too. Then we’re hangry, crave foods, get shaky between meals, feel anxious and have high fasting blood sugar. We also can’t leave out the importance of Cortisol, the stress hormone. A little bit is good for us, we need to be able to respond to stress. Buuuut, a lot of it can lead to too little of it and then you’re in a cycle of sucking down caffeine in the morning to rev up and red wine at night to unwind. Plus cortisol raises your blood sugar and cross talks with estrogen and progesterone. When cortisol is high we’re stressed, have insomnia, GERD, and overeat. All of this, becomes even more of an issue as you get close to and past age 35. UUUGGGGHHHHH. 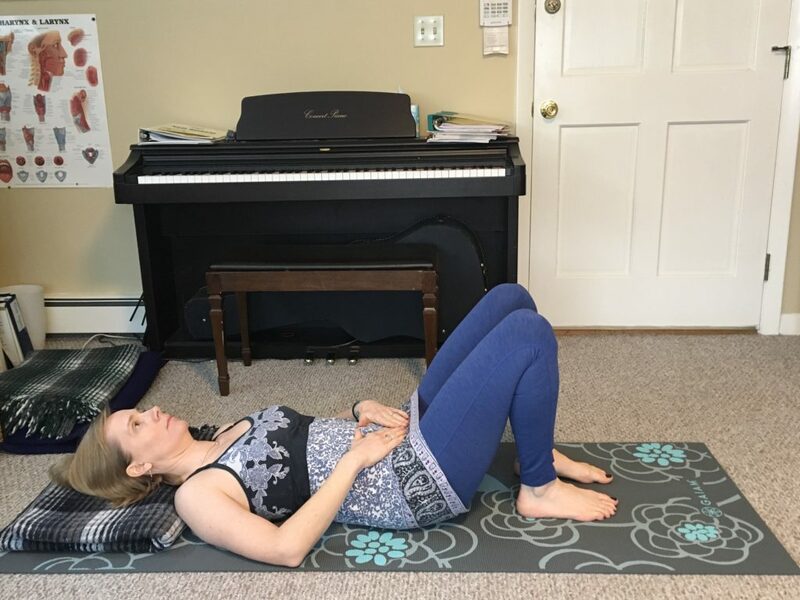 As singers who are so highly attuned to the body as our instrument, we need things to do that help us return to as close to an optimal state as possible. Exercise more and eat less is a bit too simplified for women to get the results they want, I think, but here are some ideas that can help you craft what works for you. Eat: Up your plant intake. One of the ways we get rid of excess estrogen is through poop. Yep, I said it. You need to start pooping more. I’m a fan of thinking about what we can add into our diets to improve our health rather than thinking about what to restrict. Eat a rainbow sounds silly, but it’s correct. Lots and lots of leafy green matter, red, yellow, orange, purple veggies are all good. Go slow with adding veggies because if you overwhelm yourself with too much fiber…well, that can be ugly and uncomfortable. Some ways of adding things in: throw some dark leafy greens into a morning smoothie, chop up some carrots to crunch on rather than chips. If you do better with thinking about how to lower your intake of things here are the things you want to limit: caffeine, sugar, alcohol, processed foods. Also, drink enough water for your body, but you already knew that because singers are smart about water. Move: Movement is another way we can manage our hormones. Sweat helps flush estrogen out of the body. Movement helps manage cortisol levels and balances blood sugar. Do you need to kill it at the gym? No, but you need to start moving your body more and moving it better. Maybe that looks like a brisk walk 3 days a week to begin. Maybe it’s a spin class, or a yoga class, or a HIIT workout. Find something that makes you feel good and do it regularly. Many women have found connections between tension in the back of the legs and period cramps – stretch your calves regularly for a month and see if your cramps are better. Movement doesn’t just help your hormones, it helps your singing. Cardiovascular fitness, lung capacity and overall improved blood flow are all advantageous for your voice. Chill: No, this isn’t netflix and chill. Numbing out to technology (or food, or booze) isn’t what I’m talking about. I mean, get quiet with yourself. Schedule in downtime where you literally do nothing. Find a meditation practice that works for you. Take a hot bath nightly. Spend time off of social media, the land of comparison-itis. Women thrive in the company of other women, so plan a night with girlfriends. Engaging in mindful practices helps manage cortisol levels. We sleep better, we’re happier, and we sing better when we aren’t so freaking stressed all the time. This list is far from exhaustive, but it’s a place to start. If you want to learn more, there are some great resources out there. Some of the most affordable and accessible are books by Sara Gottfried, an integrative MD and hormone expert. Her two books the Hormone Cure and The Hormone Reset Diet are must reads. Kelly Brogan MDs book A Mind Of Your Own is another great hormone/mental health read. A good functional nutritionist or hormone expert like Anna Garrett can help you test hormone levels and formulate a plan for yourself. There are lots of apps out there for meditation like headspace and Calm. There’s a yoga studio on every corner and most have some kind of restorative class or meditation class if you like in person things. If you want to talk about movement because you aren’t sure where to begin, reach out and let’s talk about what your body needs to begin to move more in a way that feels good. You deserve to thrive as a singer all 4 weeks of every month and not feel so bogged down with the changes in your body that are driven by your hormones! This blog initially appeared on The Opera Stage site. Their blog is no longer active so I have published it here to continue to allow access. Many singers will avoid doing any core exercises in the interest of having total flexibility of their abdominal area. 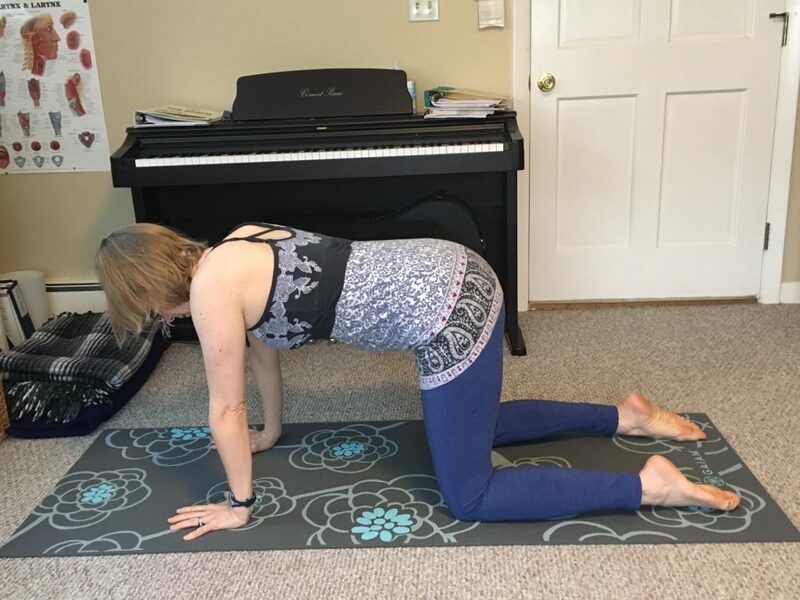 Other singers will do core exercises in an attempt to strengthen musculature that they know is connected to vocal production. And, still a third group considers what they do as classically-trained singers to be adequate work for the abs and leave it at that. For many of us, the voice works well even though our core isn’t as well coordinated as it could be. However, when the voice and/or breath aren’t working well or you go through a physical change that results in a negative shift in the functioning of your voice or body, core training is a key element of making a change for the better. A well functioning core is crucial not just for pain-free movement, but also for the voice to perform optimally. There is an important distinction that needs to be made between ‘core exercise’ and ‘core training.’ Core exercise involves doing a set of repetitive exercises without contemplating whether they are contributing to the functionality of the entire body. Core training, on the other hand, addresses functionality in the whole body: your breathing and your muscles, your existing patterns of engagement, resting tension and how you put all of that together (particularly as it relates to your voice) to establish a synergistic relationship throughout the body. What are the signs of a core-voice connection that could be improved? ” Tension in the shoulders, neck and throat/jaw region. ” Bracing of the abdomen at the onset of sound. ” A held abdominal area that lacks freedom of movement. ” A sound that isn’t well supported. ” Weight loss and loss of support of the sound. ” Reports of the voice being effortful to produce. ” Reports of breathing issues that are elusive to resolve. ” Negative vocal and physical changes post-childbirth. ” Hernias of any kind. What is the Functional Reflexive Core? The foundation of healthy movement and singing comes from the deep layer of the Functional Reflexive Core (FRC). The part of our body that makes up the FRC is our entire trunk located between where the head attaches to the neck and where the arms and legs attach to the torso. It has two layers. The deep layer of the FRC is made up of the throat, the diaphragm, the transverse abdominus, the psoai, the multifidi and the pelvic floor musculature. The outer layer is made up of all the other muscles that fall within that central part of the body. We want stability of the muscles in the outer layers of the core, and imbalances here can create problems when it comes to voice production, but when we talk about the core-voice connection, we are most interested in the functionality of the deep layer of the FRC. And, the relationship of the muscles here is heavily influenced by how we are breathing, how we are moving (or not) through our lives and our tension levels in the upper and lower body. Why do we have these issues to begin with? Modern life has left us with bodies that are ‘casted’ by sitting, wearing shoes, and moving through a limited range of motion. The good news is, our bodies are relatively plastic and have an amazing capacity to change. We just need to know how to make the change effectively and be consistent in our efforts. Abdominal Holding – As a result of sitting in chairs our whole lives, our backsides get weak, the abdominal musculature gets recruited to do work it shouldn’t be doing and we carry resting tension in the abs. Second, there is the cultural message that we are somehow more valuable if our abs are flat. That can result in people sucking the stomach in chronically or over-exercising the abs, creating a flatter but definitely not more functional mid-section. Abdominal Bracing – When the deep layer of the core isn’t functional, we can over-recruit and use the outer layer muscles to make up for the lack. Bracing can be observed in both movement and singing when there is a very visible hook up in the belly at the onset of moving or singing and then it often appears as a static hold – as though you are bracing to prepare for someone to punch you in the stomach. Bulging – This can occur on inhalation and/or on phonation and movement. If we bulge on inhale, seen through a distended belly, we overload the musculature of the deep FRC. Once overloaded, the muscles lack the relationship they need to the breath and don’t fire effectively. This type of increase in intra-abdominal pressure can lead to things like hernias and pelvic floor problems. Bulging during movement means the belly pushes out when we are doing something like lying on our back and bringing both legs up into reverse table (see below). Bulging during phonation will also show up as a belly that is pressing out in a rigid, fixed way when singing. Bearing Down – This is just as it sounds. When we move or phonate there is a sense of bearing down – almost like you are trying really hard to go to the bathroom. This is, in fact, the reverse of the motion we want to experience when we are singing or moving. We also don’t particularly want to be bearing down hard to go to the bathroom, but that’s another post for another time! Do you carry resting abdominal tension? Lie down on your back with your knees bent, feet flat on the floor. Place your hands on your belly, near your belly button. Cough. Cough 5 or 6 times. What direction is your belly moving when you cough? Does it push up into your hand? If it does, as it will for almost everyone, it indicates you carry a level of resting tension in the abdominals that is greater than necessary. That means when you are expelling air to either move or sing, the coordination between muscles and breath could be improved. Do you have a diastasis recti (DR)? Both men and women can experience DR. It is a separation of an unnatural distance between the two rectus abdominus muscles and the connective tissue, called the linea alba, is stretched and thinned. DR is caused primarily by excessive intra-abdominal pressure. To check your body for a DR, lie on your back with your knees bent, feet flat on the floor. Exhale normally and pick your head up off the floor. With the head up, use your fingers to palpate down the midline of your rectus abdominus muscles from sternum to pubic bone. See if you can feel both sides of the muscles and see if there is a gap between the two. The gap is measured by finger widths. It is also measured by depth. It may be normal for you to have some separation between your muscles, but a width of 2 fingers or greater or a depth of a knuckle or more, may indicate you have some issues with too much intra-abdominal pressure. Most men are probably familiar with the turn your head and cough test to see if you have an inguinal hernia. Inguinal hernias can also present as swelling or a bulge in the scrotum. A hiatal hernia, which is often associated with GERD will require an x-ray study to diagnose. Umbilical hernias are usually diagnosed through physical exam and present with swelling or a bulge around the belly button. All 3 hernias are associated with excess pressure and weakness in muscle. What do we do about our imbalances? Our answers to these issues lie in an approach that addresses the whole body, including alignment, breathing and movement mechanics. When we tune in to how we are moving and where our body is compensating for our limitations we can make gains quickly. Here are some simple movements to begin to explore your current patterns and function. To bring balance, strength and stability to the whole body a more complete practice is needed, but these will give you a sense of where you are in this moment and perhaps inspire you to explore more! Come onto your hands and knees and let your belly sag toward the floor without allowing the back to sway excessively. The pelvis is untucked. Breathe normally and notice if your belly releases each time you inhale. Focus on letting everything release – diaphragm to pelvic floor on the breath in. Stay here for about 5 minutes and really tune in to the space from the bottom of the ribcage to the pubic bone. Notice if you find tension returning and continue to release it each time you notice it. Try singing a few phrases in this position and notice what your body does as you breathe in and as you phonate. Lie on your back with your knees bent, feet flat on the floor. Bolster your head on a pillow so the lower ribs are on the ground. The pelvis is untucked, with space behind the low back. Place your hands on your low belly. Take a breath in and notice what moves more on the inhalation –the belly or the ribcage – ideally the ribs will move more. Begin a long slow exhale through pursed lips or on a hiss. Midway through the exhale see if you notice the deep part of your core activating in a corseting action this is NOT navel to spine. On your next breath in, release all engagement and exhale again through pursed lips or on a hiss. Do this 5-7 times. If you do not feel things engaging, don’t worry, keep practicing and the deep FRC will wake up. Notice if you flatten your back to the floor when exhaling. 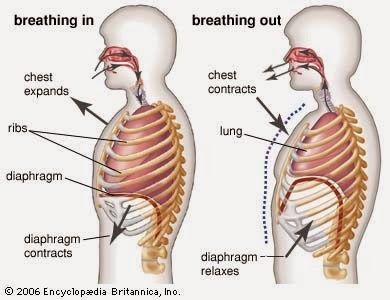 Notice if you tense in your shoulders or throat when you are exhaling. Notice if your lower ribs pull away from the floor when you breathe in. Be aware that it is easy to engage the obliques more than the transverse abdominus (TVA) muscle in this exercise. Don’t force the engagement of the TVA, allow it to happen organically. Midway through the exhale, when you have felt the FRC engage, slowly bring the right leg into reverse table. Breathe in again. And exhale, returning the leg to the floor. Repeat the above but this time bring the left leg up. Notice first if one side feels easier than the other. For each side, notice if your belly bulges while moving the leg into the air, or if you are bearing down as you bring the leg up. Notice if your hips wobble or shift or if your back flattens to the ground as you bring the legs up. Those are all signs you have some work to do to improve function. For an advanced version of this pose, bring one leg up and then on the next exhale, bring the other leg to meet it. If you have any of the above issues, back up to the phase before. Waking up the deep layer of the functional reflexive core can feel like slow, small work, but the payoff is huge. Having a body that supports you as you move through your life on stage and off, providing you with a solid foundation for the voice to be produced, is an invaluable tool for a singer. If you have questions or would like some help waking up your FRC, don’t hesitate to reach out by email or connect with me on Facebook. Today I worked with a client exclusively on breathing and I realized she was asking me the same questions I get from almost everyone about breathing so I thought I’d address them here. I’ve seen it in almost every book I’ve read, whether it is about the voice or the body…there is one way of breathing, as described in the book and that is the BEST WAY. Really? That to me creates a cult-like religion of breathing and I just am not down with that. We can talk about a biomechanically optimal breath, and I do teach people what that is, because I believe it is valuable to know, but (you knew there was going to be a but, right? ), that’s not my end goal in working on someone’s breath. If your breathing is disordered, I’d like to help you find a breathing pattern that supports your body’s health. Sometimes that looks like addressing ribcage mobility. Sometimes that looks like changing the breath ratio. Sometimes that’s moving from mouth breathing to nose breathing. And, sometimes it’s all of the above plus a few other things. If your pelvic floor is suffering, I want to teach you the ways in which your breath can impact the pelvic floor and help you find ways of breathing that support your movements so you no longer wet your pants when you sneeze. If your goal is to sing your best or speak your best, my goal is to help you find a freedom to the breath so it responds to the emotion you are trying to communicate and contributes to the colors of the voice that reflect that emotion. If your body is in pain, my goal is to help you optimize your breathing because that will both help lower your pain response, but a good exhale always facilitates better movement too. Why is my breathing a mess? Breathing is governed by the autonomic nervous system. That means as long as you are alive, your body is going to breathe. That also means when your nervous system is out of whack – due to stress – your breath is going to change. Sustained stress, means sustained breathing changes. However breath isn’t completely at the mercy of stress. The breath is actually our most efficient mechanism for shifting the nervous system. Breathing is also reflexive, meaning we breathe in response to the way we move. If you aren’t moving much, your breathing isn’t being varied and it’s easy to get stuck in a pattern of limited breathing. How do I fix my breathing? There is no one right way to ‘fix’ disordered breathing because there is no one right way to breathe. I want you to have the ability to breathe appropriately given the situations you encounter. I usually start with a series of assessments of just breathing and breathing and movement to see where you might be running into breath blockers (bulging, bracing and bearing down) and from there, use a series of breathing practices that progress from simple to more complicated and work with breathing and movement to see how the two fit together. If we’re putting it together with the voice, we listen to sound and emotion and see how they’re working. It takes time, awareness and practice, but there’s no need to subscribe to a cult of breathing where you think there’s just one way to breathe and that way will magically provide the answers to all your issues! Asthma is on the rise – in 2010 the CDC indicated there are 25.7 million people in the US living with asthma, and they indicated they expect an increase of 15% per decade (1). That’s a lot of people who are struggling to breathe and if your studio is like mine, you’ve seen an increase in singers who are dealing with this issue. What singers with asthma have shared with me: they struggle to get through phrases, feeling like they are running out of breath. Higher notes feel harder to hit and to sustain. And, when their asthma is active, singing at all can feel like an impossibility. Asthmatics have differences in breathing patterns, ribcage position and mobility as well as quality of speaking voice and singing voice. Asthma is defined as a chronic disease in which the airways can be inflamed, constricted and lined with too much mucus during an asthma attack. The symptoms of asthma can be triggered by a number of stimuli including: pet dander, dust, pollen, tobacco smoke, emotional stress, cold air, exercise, fatigue, infection or food. Symptoms of an asthma attack include coughing, wheezing, and shallow, fast, labored breathing as well as a rapid heart beat. Asthmatics also have a greater likelihood of experiencing reflux, rhinosinusitis, sleep apnea, and they are more likely to experience anxiety – much more on this in a bit. Medical management of asthma includes both bronchodilators and corticosteroids. Bronchodilators are ‘rescue’ inhalers, like Albuterol, used to bring quick relief of the symptoms of an asthma attack. Corticosteroids, like Prednisone, are used to manage the chronic inflammation that many asthmatics experience. As with most medicines, both types of treatment carry risks/side effects. Rescue inhalers can mask an increase in chronic airway inflammation and therefore mask the severity of asthma when they become overused. Corticosteroids can reduce the need for rescue inhalers, but can cause hormone changes, weight gain, glaucoma and bone loss as well as hoarse voice and thrush. Many singers with asthma know to rinse their mouth out after using an inhaler to help their voice function a bit better. To be clear, I am not advocating in any way, shape or form, abandoning the medical management of asthma. What I would like to suggest is there are some practices you can engage in that can help you manage your asthma, change your experience of breathing and how you experience your voice. When I was first researching asthma back in 2008 I was fascinated to see that reflux, sinusitis and anxiety were all factors that were frequently concurrently present. To me, that suggested that a whole body approach was going to be an important one in managing this condition. Diet, stress management, weight, movement and general health all need to be considered in the treatment and management of the disease. We know the breath is intimately linked to anxiety – when we get anxious the breath becomes higher and shallower. There is no doubt in my mind that feeling like you can’t breathe is an anxiety producing situation! It isn’t clear which came first, anxiety or asthma, and in some ways it doesn’t matter, we know the two go hand in hand. One of my goals in working with singers with asthma is to help them break the cycle of anxiety and breathing. Here is my action plan for working with an asthmatic in the voice studio. It is built on the following: Awareness, Skill Building, and Implementation. That process is rarely linear but it is a combination of those three areas that helps singers find success. Do an extensive intake questionnaire so you know from the first meeting what all the factors are in terms of asthma, allergies and acid reflux, anxiety and medications along with how much they are moving throughout the day. Complete a breathing assessment in the initial lesson. Asthmatics are classic ‘over-inhalers’, meaning they are taking in more air than they are letting back out (not hard to see how that would impact singing, right?!). Within the assessment discover the breath ratio and explore mobility of the ribcage. Very often it is ‘stuck’ in the inhale position (called ribcage flare) and part of the work they need to do is to learn how to move the ribcage on the breath in AND the breath out. Give the singer the task for the week between when they will see you next of observing their breath in different situations – low stress, high stress, hanging out with friends, speaking in public and private situations, while they are singing, in the morning and at night. In the studio begin the lesson with gauging where the breath is that day. Use the first 5-10 minutes to do some kind of breath work to help balance the breath. ** DO NOT do this if they are symptomatic. If they are symptomatic begin here. If they are not, do this next, and incorporate it into vocally warming up. Use postures that target the thoracic spine, ribcage and diaphragmatic ability as well as deep relaxation through forward bends, spinal twists and psoas release. If you have a singer you are working with, or you are a singer with asthma and I would like some support on your journey, don’t hesitate to reach out! Have you ever wondered if you or one of your singers is a breath holder? It is more common than you might think and can be one of the factors contributing to vocal fatigue, tension and increased effort in producing the voice. While there may be pathology on the cords that contributes to these issues too, many singers will get a clear strobe showing vocal cords that look and seem to function perfectly well, yet they are experiencing issues. Breath holding can be a long term habit or it can arise as a result of a particularly stressful experience or a change in breathing resulting from an upper respiratory infection. (I write this as someone who was a breath holder as a result of a very stressful time in my life – I was literally holding my breath waiting for the next bad thing to happen, but I resolved it with time, awareness and practice.) How it came to be is almost beside the point, if it is happening we need some strategies to resolve it. Physiologically, when we hold the breath back, there is a change in the way to vocal cords function, such that they are restricting the airflow. In the people I have worked with I have found there is also a change in the function of the musculature of the upper body that restricts motion of the parts that need to be moving (muscles of respiration, abdominal musculature, joints, tissue of the lungs etc.) – often their ribcage is lacking motion in at least 1 plane. 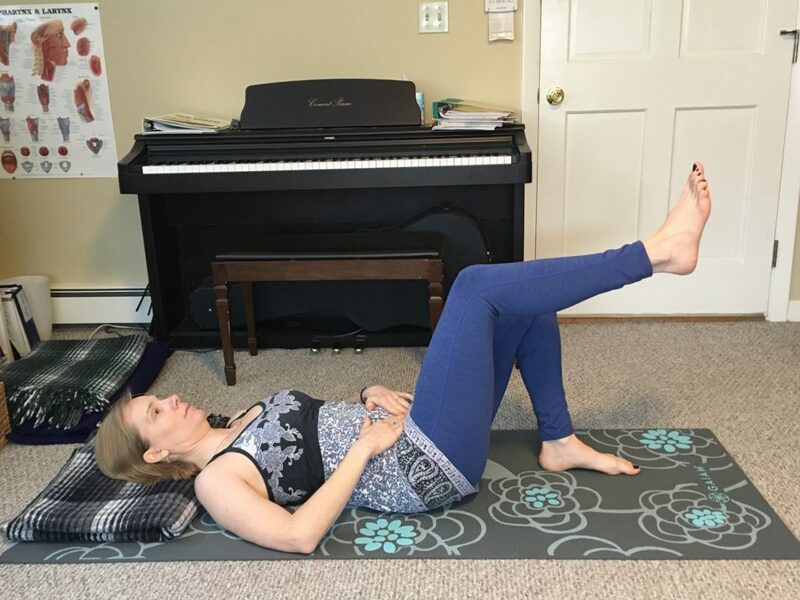 I was also someone who carried a fair amount of constant engagement in my abdominals and needed to find ways to release those so I could turn on my reflexive core. How do you identify breath holding in a singer? For one, you can watch the ribcage and abdomen while they breathe – always ask yourself is there movement and what is the quality of it? Do this for both the inhale and the exhale. I like to assess breath while the person is just breathing, while they are speaking and while they are singing. What you may hear (you probably won’t hear all of this in one voice, but you might hear a combination of these things) is an audible intake of air, a glottal at the beginning of a word, a quality of pushing to the voice, a phrase ending with lots of vocal fry and sometimes that little puff of air coming out after they’ve finished the phrase. The person might report that their throat is sore, it feels tight and the voice just feels plain effortful. I was that person with the extra effort going on, especially at a tessitura that put me near the passaggio, D5-G5. The solution comes from a whole body approach that uncovers stress response patterns and creates an exhalation that is free. Using awareness practices we can ask students to begin to notice their breath in stressful situations. We can all relate to watching something like a down-to-the-wire sporting event moment where we hold our breath in response, or watching a movie where a character is about to meet his untimely end and we know it is coming but he doesn’t. What do we do in those situations? We hold our breath. If they are breath holding in response to stress, simply raising their awareness and remembering to keep breathing is a huge step in the right direction. We can begin with breathing practices of yoga to give us some information about our breathing patterns. These practices are particularly valuable when taking time to explore and assess your habits. Breath Ratio is a great place to start. Then move into extending the inhale and exhale to both be long and smooth – always staying in your pure range – where there is no pain, strain or compensation. When the body fights the extension of either, that’s your edge and you want to work within that range rather than trying to push past it. However, I haven’t encountered too many pieces of music where you can get 2 or 3 solid measures of rests in between each phrase AND we need to be able to phonate while we exhale, not just exhale. So we have to be able to incorporate breathing and singing. Using a 10 minute practice that combines breath and physical motion, targeting the muscles of the torso can do wonders in liberating the breath prior to singing. Then, moving into singing phrases out of context to implement the new breathing patterns and slowly decreasing the length of time you are taking to inhale between phrases until the body can do so in a liberated way has been a solid approach for the voices I’ve dealt with. If you are interested in exploring your breath more, set up a free 30 minute consult and let’s talk about how to get your breath flowing more freely! In the first post we looked at the diaphragm and its role in inhalation – It is the primary muscle involved in the lifting of the ribs and the expansion of the abdomen upon inhalation. To be extra clear, it is always involved in breathing – there is no such thing as a non-diaphragmatic breath. It is just a matter of how efficiently it works. When you are a singer you need it to be very efficient, and how the body is positioned influences the way we use the other muscles of inhalation and exhalation all of which allows the diaphragm to function efficiently. When we sing we need to slow down the rate at which air is expelled so it matches the needed amount to set the vocal folds in motion at the appropriate pitch and gives you the ability to sing through a phrase. We can’t do that with the diaphragm because we have no direct control over it. We accomplish this by engaging the accessory muscles of exhalation. (When you aren’t singing you can slow the breath down by pursing the lips on exhale, hissing, or by using an ujjayi breath). The abdominal muscle that has the most direct relationship to the diaphragm is the transverse abdominus, the deepest layer of belly muscle, because it attaches to the body at many of the same points that the diaphragm does. We often refer to muscles in pairs as antagonists (think bicep and tricep in your arm). The transverse abdominus is the antagonist of the diaphragm. The other accessory muscles and their antagonists include the obliques (belly) and the costals (ribs), but we’re looking most closely at the transverse abdominus here. 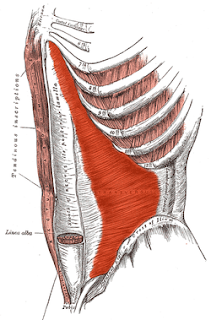 Transverse Abdominus in deep red above. If the diaphragm returns to its resting position quickly, you get a big burst of air that will either make your sound breathy, out of tune or more difficult to create than it should be. So, when we slow its return down by engaging the other muscles of the abdomen and back, especially the transverse abdominus, you create what is often referred to as ‘support’. So, how do you know you are engaging the transverse abdominus muscle? Lie down in a well aligned manner. Place your hand just above your pubic bone on your low belly. Exhale through pursed lips or on a hiss, continuing until you feel as though you are out of air. Like, really, really out of air. While exhaling pay attention to where you feel muscle engagement – hopefully you feel it beneath your hand in the lowest part of your belly, almost as low as where the pubic bone is. It is a subtle in-and-up motion. That muscle engagement is the transverse abdominus muscle which wraps around the torso like a corset. If you aren’t sure if you engage it when you sing, try vocalizing on the sounds v, m, n, or the ng sound from the word sing with your fingers pressed into your softened belly. Those sounds are good triggers to engage the muscle and you’ll feel it press against your fingers when you vocalize. This is one of the questions asked of students in my voice studio at their first lesson. My least favorite, yet most common response is, “well, I know you breathe from the diaphragm,” uttered as they hold their hand vaguely over their abdominal area. If that is their answer we go no further. The diaphragm, for those of you who don’t know, is an involuntary muscle. That means we have no direct control over it. We cannot make it do anything. At all. When not engaged it rests at the bottom of the rib cage. When activated it contracts and pulls and aides with inhalation. Because it is an involuntary muscle, we do not ‘breathe from the diaphragm’ anymore than we breathe from our stomach. We breathe through our mouth or nose, down the trachea and into the lungs. Breathing occurs through an interplay of muscles, including the diaphragm, that pull on lung tissue, create negative pressure and allow air to rush in (a very boiled down explanation with apologies to those who do anatomical things for a living and would give a more complex, in depth explanation). What we want is a diaphragm that is free to descend to its maximum position, allowing the bottom portion of our lungs, where the bulk of our lung tissue lives, to fill with air, giving us the best shot at singing long phrases. When teachers and conductors and the like tell students “Breathe from your diaphragm!” what they mean is release your abdominal muscles and get the ribcage in an optimal position so the diaphragm is free to descend on inhalation. We ‘feel a low breath’ because there is expansion in the belly as things move around. The way the diaphragm is involved with exhalation and how it is paired with its antagonist muscles in the abdomen to provide the foundation for a supported sound is for another post. Go forth and sing, but know that you aren’t controlling your diaphragm as much as you might think you are!